I'm adjusting my timing and following the instructions on page 19 of the manual. 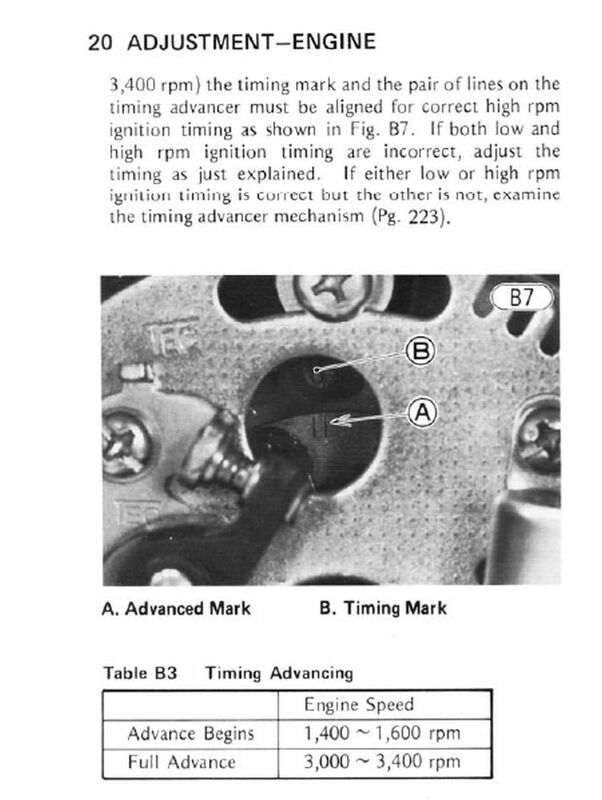 It states if the timing is incorrect (which it was as determined previously) to move the crankshaft to the timing mark for the 'F' mark , then adjust the contact breaker mounting plate so the contacts are 'just at the point of opening' or watching an ohmmeter needle flicker. Could there be another reason for this? I have attached the page of the manual I am using. The timing plate and the poits back plate are all the adjustment range there is in the set up. If you cant get them to open at the correct mark adjusted fully in either direction there a few things you could do. Firstly are 100% you have the correct points for the bike? Things you could do if you have tried everything else, either file the points heel down which would mean they open later or you could file the slots longer in the backing plate giving more adjustment. First you have to set the gap of the points to 0,3 - 0,4 mm clearence at maximum opening. --- The GAP – this is the distance the points spread apart when fully open. This is set by adjusting the points. The GAP is the element that determines the DWELL. In essence, the DWELL is the number of degrees of points cam rotation that the points are closed and this controls the amount of time the coils receive a charge before firing the spark plugs. The gap MUST be set before you set the timing. Could it be that all too commonn 180 degree off lobe? Did you take the lobe off of the advancer? With that tiny speck of a mark at around 4:00 o'clock position? Did not read too much in to this? Yes, in following the manual I have already set the point gap; it was to spec as per the manual and then I continued on to the static timing. No I hadn't taken off the timing advancer at the time. Also after I move the plate, I make sure that the it is tight on before doing the static test. Attached is a video of a continuity test. The beeping stops when the points are no longer touching. In the video this happens when what I think is well before the 'F' timing mark. so I guess a picture will do. The picture is the point where the beeping stops and the points begin to open. 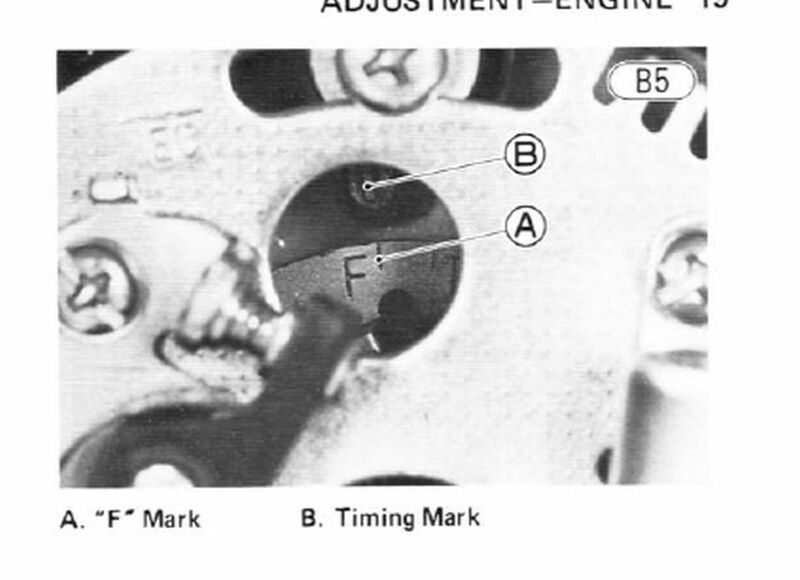 Not the "F" letter is the firing mark, the (red) score on the advancer body is "F" mark @ idle. BTW, Video files max. 10mb. 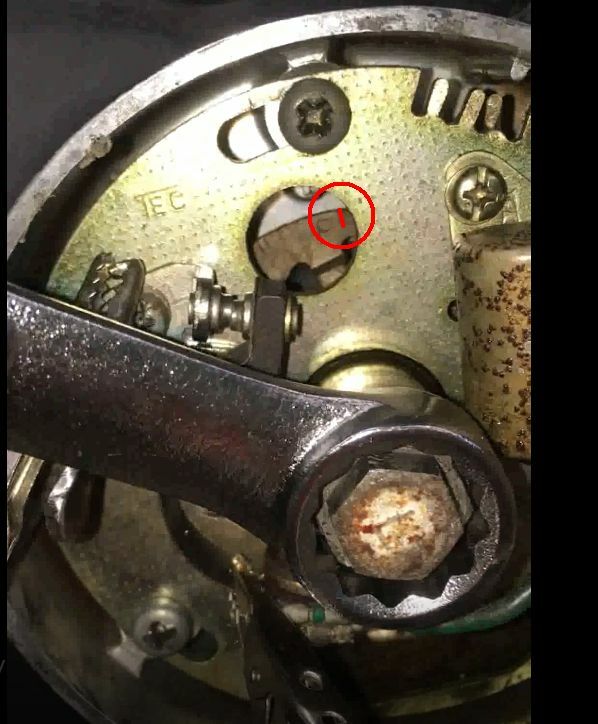 Is the advancer functioning correctly, clean and lubed and not rusty, and not stuck in the advanced position? SWest wrote: Points look worn out. Spring might be crooked keeping them from lining up properly. Thanks all! I am not the original owner of this bike so I'm doing a good shakedown, even just finished making that custom airbox for it in another post. Scirocco -> right the timing mark is where it should be lining up, so on my bike it is really far behind in my opinion. SWest -> where is this spring? 650ed -> the manual I believe doesn't go into detail on adjusting the points themselves, so (if the points were still good and not worn down) how would one get them to line up right? Adjusting that bending 'tab'? Also the manual states to buy a new contact breaker if the points look worn. Should I try cleaning it first? I couldn't tell that they looked worn down. If they are worn offset the spring going from the screw where the wires fasten then to the points themselves could have been the cause. Are they worn that way or just offset? That could account for them opening at the wrong time. Honestly, all the times I've looked at them, they've never looked damaged or dirty, they just look like they are mispositioned. I wonder how that could have happened though as I doubt the PO took a look inside anything. I'll try and see if I can find this spring. The spring is what makes the points close. 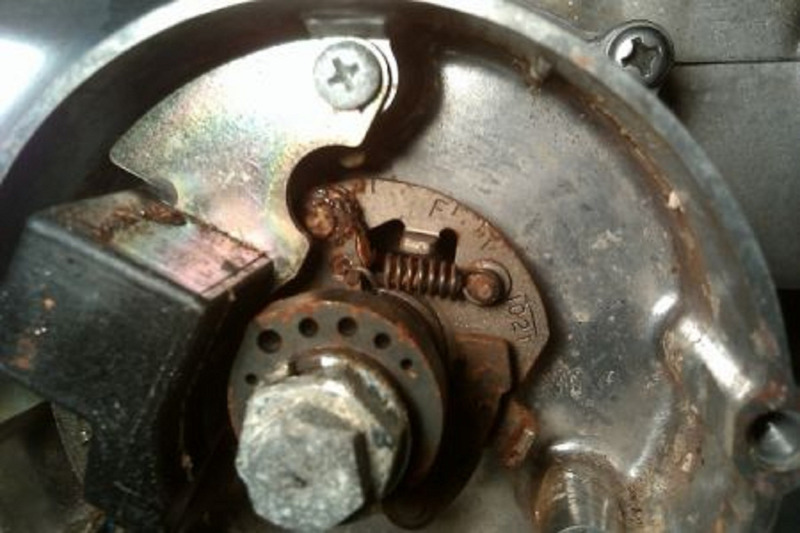 Patton wrote: Is the advancer functioning correctly, clean and lubed and not rusty, and not stuck in the advanced position? . . . . Does the advancer look anything like this?